When we talk about drying fruits, the very first fruit which comes into our mind is the apple. 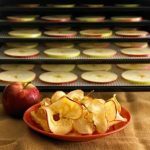 It is quite easy and an exciting way to dehydrate apples in a food dehydrator. You just need one good machine and leave the rest to it. Some of you might be planning to cook dried apple chips or dried rings of the apples this weekend. But there are lots of things which you should keep in mind while picking the best apples to dehydrate. Few people like tart apples more than the sweet one. Some also prefer medium intense flavor than the high intense flavor. But before dehydrating apples, do you know that how many types of apples are there which we can dry?